Herringbone tread design and supple casing provide great handling of the bike on both wet and dry conditions. Great open tubular (clincher) tyre choice for racing or training and available in either 23c or 25c options. An open tubular is constructed using the same casing and tread materials and process as a tubular, but instead of sewing the casing together (closed), the sides of the tubular casing are folded around aramid fibre cords to produce beads. This ‘open’ design performs like a tubular, yet conveniently mounts like a standard clincher tyre. If combined with a Latex inner tube the ride becomes even closer to that of a tubular, offering excellent traction and cornering, low rolling resistance and shock absorption. In 2003 Challengetech created its own brand “Challenge”. Challenge, as the word says, wants to point out how difficult and exciting it is to keep the tradition of high quality products, created with obstinacy, with the steady research of special materials and through handcrafted processes. Since the 2000s, Challengetech has being producing tubulars for other brands, thanks to the constant use of these products in the professional cycling. 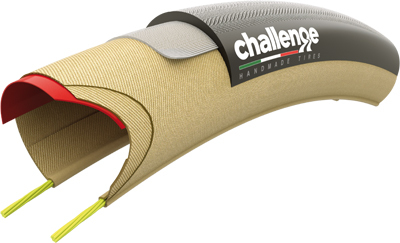 Challenge Elite Open Tubular Road Tyre is rated 3.4 out of 5 by 5. Rated 4 out of 5 by CharlieP from Quality Tyre I've been trying a variety of tan sidewall tyres for a while, and this one is the pick of the bunch so far. The high thread count casing makes for a light weight and super supple ride; the marketing is true. It feels much smoother and softer and stays in contact with the road really well. It FEELS fast. I'm on my third pair and so far they've been pretty reliable. My first pair I wore through without a puncture - about 1000 miles. The second pair I got four punctures... three in two days, including a pinch. I feel like bad luck had something to do with it, and the wet weather. My third pair are back up to form and holding well. There are a few slashes in the top surface but all good so far again. Mounting the tyres the first time can be tough, I needed a second pair of hands for one of them. Once on and worn in they pop on and off pretty easily though. It's just the first fit that can be tricky. The inside of the tyres is really tacky, to the point that you have to peel the inner tube off with a degree of force. This is the first time I've ever had this with a tyre. There's nothing inherently wrong with this, and you can talk the inside if you're worried. I did have one quick patch get ripped off though, so don't bother with these now. Traditional puncture repairs hold up well though. With the supple casing, cornering is excellent in the dry. I haven't given it too many beans in wet corners but haven't had any concerns. Overall a very good quality tyre, just a few little niggles if you're fussy like me. Rated 5 out of 5 by azimus from Challenge does it always! Very good grip with respect to my old Conti Ultra Sport. I can feel handling is much more better in bot wet and dry weather. You will notice the difference especailly in wet weathers. Rated 5 out of 5 by Thewoodbutcher from Nice rolling tyre once fitted. Did take a bit of fitting on my Vision TriMax wheels but once they've been fitted and stretched for a couple of weeks they become easier to get off and on. Plus amber wall tyres are the best looking on any bike. Rated 1 out of 5 by GJTS from Puncture like a kids party balloon! In over 20 years of road cycling, I have never had so many punctures. Yes the gum walls look fantastic but these tires have been a nightmare from day one. They were extremely difficult to get on my rims for the 1st time, but after much tire ironing, I did eventually get them on. This was a couple of months ago and since then I've had numerous punctures, 3 alone in the last week, and can see clear gouges/holes in the rubber. They've now been swapped out for some Conti GP 4 Seasons. I don't like to be negative, but sorry Challenge, these are best avoided, they just don't work on UK roads. The grip is fantastic when fully inflated, they look great, but they just puncture far too easily! Open tubular tyre is confusing, is it clincher or a tubular? I think that Vittoria describe their open tubular as a clincher with the qualities of a tubular. The manufacturing technique is closer to that of a tubular carcass, but retention is by standard clincher method.